Two years after AJ Hines became the first-ever Northeast Conference footballer to win a STATS Legacy Award, Duquesne’s highly-decorated running back has teamed up with Wagner’s Ryan Fulse to make more history. For the first time, both running back slots on the STATS Football Championship Subdivision (FCS) All-America First Team are occupied by Northeast Conference rushers. Fulse (137.1 ypg) and Hines (120.3), who ranked first and second respectively amongst FCS career rushing leaders active during the 2018 season, led a contingent of six NEC athletes who earned STATS All-America honors. After averaging 39.1 yards per kick return, Bryant junior Jean Constant joined Hines and Fulse on the STATS All-America First Team. The three First Team selections are the most ever celebrated by the NEC in the same year. The 2018 season also marks only the second time ever that the NEC has produced multiple First Team honorees. Linebacker Christian Kuntz (Duquesne) and safety Lorenzo Jerome (Saint Francis) gave the NEC double representation on the First Team Defense in 2016. Central Connecticut guard J’Von Brown (Offense) and Wagner outside linebacker Cameron Gill (Defense), both juniors, comprise the NEC’s presence on the Second Team in 2018. Meanwhile, Saint Francis U senior safety Hakeem Kinard, the leader of the NEC’s top-ranked defense, earned a spot on the Third Team. For the eighth year in a row, the Northeast Conference garnered multiple STATS All-America selections. The six honorees mark the NEC’s highest single-season total since 2014. North Dakota State, awards finalists lead 2018 @FCS_STATS All-America Team. The Walter Payton Award candidate, who went over 100 scrimmage yards in nine of 11 games highlighted by a 251-yard day at Montana State, paced the nation in all-purpose yards average (177.36) despite not returning a single kick or punt this season. The NEC Offensive Player of the Year, who scored at least one touchdown in all nine of Duquesne’s victories, exceeded 200 yards from scrimmage on four different occasions during the regular season stretch run and did so again in a FCS First Round road win over CAA member Towson. The active FCS career leader in kick return touchdowns (5) averaged a national-best 39.1 yards per run back highlighted by a game-winning 88-yarder at MEAC member Howard in Week 12. The NEC Defensive Player of the Year, who led the NEC with 13.5 sacks, made the second-most tackle-for-loss (24.0) in the FCS and logged at least 2.0 hits behind the line of scrimmage in seven different games including visits to Montana State and ACC member Syracuse. The 350-pounder protected the NEC’s least-sacked quarterback and started all 11 games at Left Guard for conference’s top-ranked offense, which averaged 6.8 yards per play and 5.9 yards per rush. The highly versatile senior safety, who was amongst the NEC’s top-nine leaders in both passes defensed (11) and tackles-for-loss (9.5), spearheaded an SFU defense that ranked seventh overall in the FCS. Four Northeast Conference footballers received All-America honors from the Associated Press, marking the highest single-season total in league history. Topping the three AP All-America selections garnered by NEC athletes in 2016, Wagner RB Ryan Fulse (First Team), Duquesne RB AJ Hines (Second Team), Robert Morris TE Matthew Gonzalez (Second Team) and Wagner LB Cam Gill (Third Team) accounted for a banner showing in 2018. Fulse ranks amongst the FCS’ top-four rushers for the second straight season. He totaled more than 100 yards from scrimmage in nine of 11 games this season, including a 25-1 yard day at Montana State. ACC member Syracuse was lone team to hold him under 90 scrimmage yards. Hines, the 2016 Jerry Rice Award winner, exceeded 1,000-yard rushing mark for third straight season. He scored at least one touchdown in all eight of the team’s regular season victories, including 3 TD rushes in Week 2 win over Valparaiso. In four of the Dukes’ five NEC triumphs, the pwerfull runner racked up more than 200 yards from scrimmage. Gonzalez emerged as a serious threat in RMU’s passing attack, leading the NEC with 12 touchdown receptions (the second-most TD catches by a FCS tight end this season). The 6-foot-3 junior finished the season as the No. 1 receiver on a team that saw a 140+ percent increase in scoring offense from the 2017 campaign. Gill, a 2018 Buck Buchanan Finalist, made second-most tackles-for-loss (24.0) in FCS. After ranking second amongst NEC sacks leaders as sophomore, the junior led circuit with 13.5 QB takedowns. The explosive edge rusher accounted for at least 2.0 TFL in seven games, including visits to Montana State and ACC member Syracuse. The Northeast Conference is home to multiple Google Cloud CoSIDA Division I Football Academic All-Americans for the first time since 2014. With Oregon QB Justin Herbert headlining the list, 51 student-athletes from across all of Division I (FBS/FCS) received the prestigious accolade. Robert Morris senior linebacker Adam Wollet, who was one of 17 repeat national selections, landed on the First Team while Wagner senior tight end Chris Woodard earned a spot on the Second Team. The NEC, which has produced at least one Academic All-American during seven of the past eight seasons, had not celebrated two selections in the same year since Sacred Heart running back Sean Bell and Robert Morris center Nick Faraci appeared on the 2014 Second Team. 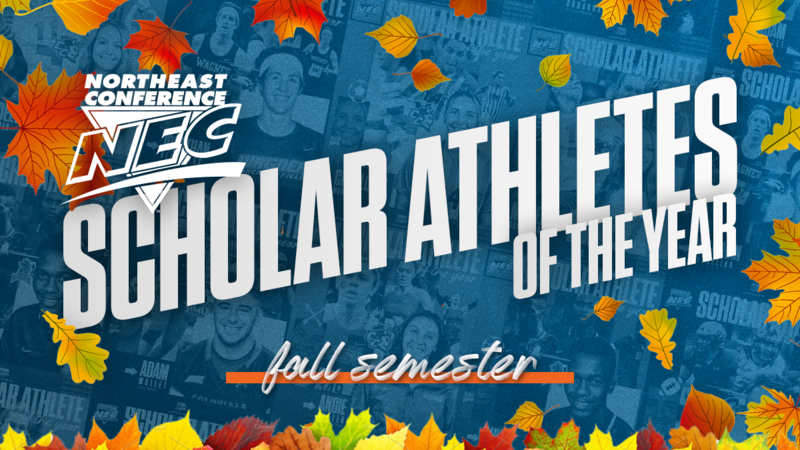 Through 10 weeks, Northeast Conference athletes and teams have logged numerous spectacular accomplishments on the gridiron. In prepping for Week 11, we stumbled upon some timely eye-popping facts to share with our readers. Sacred Heart rushed for nearly 900 yards (538+347) over its last two NEC contests. Bryant LB Thomas Costigan, who has logged at least 1.0 TFL in seven of his last eight appearances, had totaled 6.0 stops for a loss over his two most-recent outings. 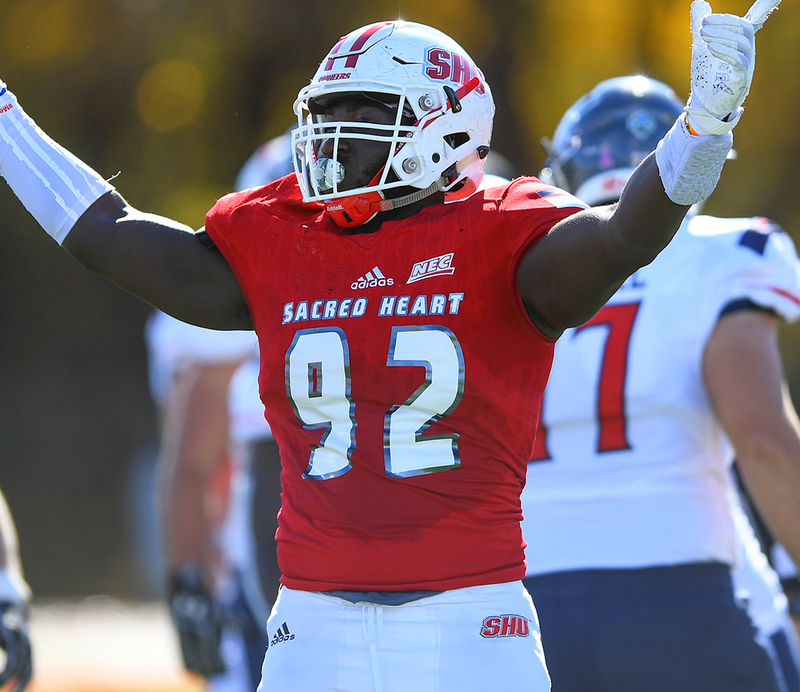 Sacred Heart DE Chris Agyemang, who totaled only nine tackles last season, has made 5.0 hits for a loss over the past two weeks. Saint Francis safety Nick Rinella was his team’s leading tackler (11) and rusher (60 yards) during a Week 10 win over Bryant. What a superb all-around effort by @RedFlashFB junior Nick Rinella in a 27-14 @NECFootball win over Bryant. He led the team in rushing (10 carries for 60 yards & a TD), tackles (10) & return yards (94, with 70-yarder on a kick). He sealed the game with an INT late in the fourth. Limiting rushers to 2.8 yards per carry, Duquesne has allowed only 383 rush yards through four conference contests.